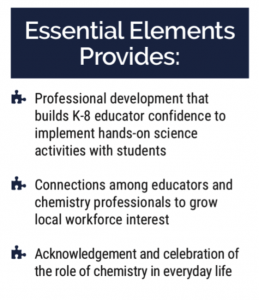 You Be The Chemist Essential Elements help build educator confidence to teach more science, better. Essential Elements is based on the 5E learning cycle approach to teaching, which is based in the theory of constructivism. Through this cycle, students build their own understanding of new concepts from both prior and new experiences. Each part of the cycle describes a phase of learning: engage, explore, explain, elaborate, and evaluate. During an Essential Elements workshop, the instructor will lead educators through a full 5E learning cycle using a lesson from the Activity Guides. Educators then get a chance to collaborate and plan their own 5E lesson from additional Activity Guide lessons. Workshops are offered both in person and virtually throughout the year. 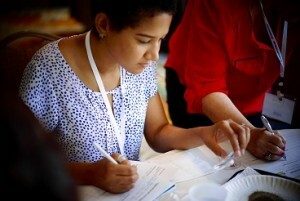 Want to lead Essential Elements workshops in your community? Learn more about our Certified Instructor program here. To bring an Essential Elements workshop to your community or sponsor a workshop for educators near you, start by completing our online inquiry form or email essential.elements@chemed.org. Is there a cost associated with the workshop? Workshops are conducted at no cost to the educator or school district! Workshops are often sponsored by local industry members. Who conducts an Essential Elements workshop? Workshops are conducted by either CEF staff or an Essential Elements Certified Instructor. 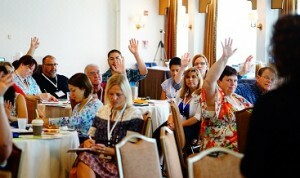 How long is an Essential Elements workshop? A workshop typically lasts two to three hours. What kind of resources will I receive at an Essential Elements workshop? All attending educators receive a Periodic Table poster, our Activity Guides, and additional CEF giveaways! Is there an Essential Elements workshop happening near me? View all upcoming workshops – including virtual workshops! – on our Workshops page. Can I receive continuing education units/credits for attending an Essential Elements workshop? This varies from state to state. For specific state inquires please contact essential.elements@chemed.org. 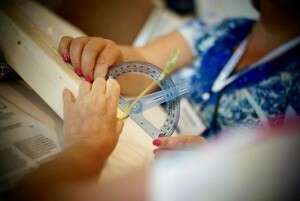 How many educators generally attend an Essential Elements workshop? I attended an Essential Elements workshop – where can I find links to the resources we used? View our Educator Resources page!